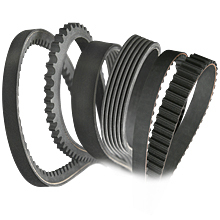 Production of HOLA drive belts includes using advanced materials and technologies. Flexible and heat resistant rubber mixture ensures full protection to oil and heat actions. Polyester fiber of counter winding inside chloroprene rubber with high flexibility and short elongation provides excellent resistance to fatigue and shock loads. Round tooth profile: arch top and rounded angles ensure equal elongation load and equal connection between pulley groove and belt edges which prolongs life-living of belt and decreases pulley wear. Modified standard tooth profile used in specific HOLA belts ensures decrease and equal spread of temperature and bending loads. Proper lateral rigidity guarantees high resistance to belt shifts on pulley. High-accuracy standard tooth is made with exact teeth pitch. Uniform chemical compounds and thickness of lower layer of cord provide smooth and no-noise run. Automatic production guarantees high quality. Designed service life minimum 3 years or 100 000 km mileage*.